Photo courtesy of Rebecca Kuhn. Menu found in Busan, South Korea. With belly button cheese as an appetizer. Oh look, it comes with a side order of crabs! Is that my dinner in your pants or are you just happy to see me? If the cook seems to walk in a funny way, it is because someone ordered the crotch steamed dish earlier. I hear it’s a long slow process with lots of foreplay involved. I wouldn’t be seen ordering that in pubic. And how about some fried lice? Okay, now I’m really steamed. This is why you don’t put the Home Ec teacher in charge of the abstinence program. Officially recommended, confirmed, approved and not being eaten by Mr. Gumby and the Ministry of Silly Walk. I’m just glad it’s not steamed crotch. Meatballs? You might say that. Depending on the cook’s gender, your preference and your desperation, that can be really hot I suppose. Waiter, there’s a hair in my Crotch Steamed Dish. If you think that’s bad, you should see how the waitress warms up the Hotdogs. If the Japanese traditionally ate Sashimi off a naked woman, I guess the Koreans are entitled to their own perversions. Pubic hairs on the side. All of our crotches have been steamed at one time or another! 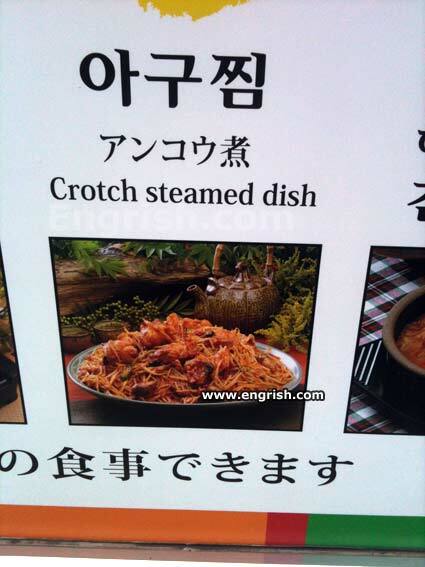 It’s called Crotch Steamed Dish because that’s where it always lands if the waiters spill it on you. Extra crotch seasoning in hot weather. Nice and be salty for your pleasure! I know the chef has the hots for me,but this is ridiculous. … what were they TRYING to say?? Usually it’s pretty obvious, but this has me stumped. THIS is why they invented athletic cups. havent you heard of a microwave?????? We guarantee… It’s hot as balls. Beware of the yeast infection! You know it’s cooked through when the juices run clear. My Korean wife still says “crouch” instead of “crotch” even though her English is good. At least she doesn’t reverse them the other way. Warning: this dish may contain traces of nuts.